After two days of wandering aimlessly in maze-like streets and surveying what looked like Aladdin’s Agrabah, it was time to make a move again. I left Yazd with both sadness and excitement. I really liked the city, and told myself that I’d return one day. But at the same time, I was looking forward to our next city, which everyone we met along the way had been raving about. There was this rhyme that a local had taught me, it was a Persian adage that goes: Esfahan Nesf e Jahan which means “Esfahan IS half the world.” To the unfamiliar, this may seem like a cheeky thing to say. 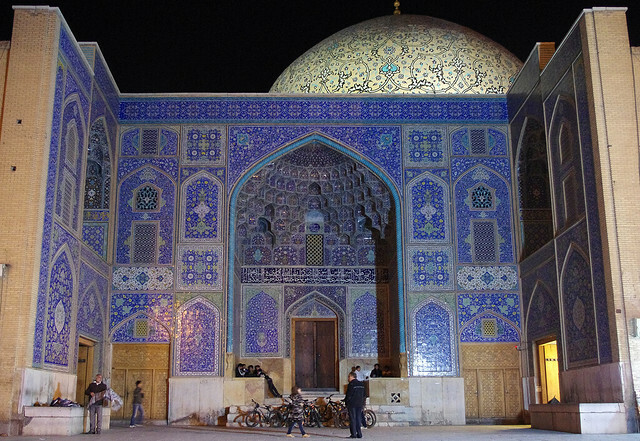 But I later realized Esfahan is one of those places where you really have to be there to see it. Home to awe-inspiring mosques, palaces, gardens, churches and bridges, Esfahan is considered the masterpiece of Persia and widely considered to be – you better believe it – one of the world’s finest cities. It was against this backdrop that I didn’t manage to sleep at all during the almost 5 hour bus ride from Yazd. As a tourist attraction, Esfahan probably ranks second only to Persepolis in terms of worldwide recognition and popularity, and many of the locals we’ve met so far asked us if we had already gone there (aside from kitschy Kish Island, I don’t really know why they love that place). Thankfully, we were assigned to a spanking new bus for this trip. With only 3 seats in a row, the space was akin to a business class seat in an Airbus A320. And for only $5, this was really living the life! We arrived at Esfahan shortly past noon. Feeling hungry, we decided to have our lunch in the bus terminal. Lo and behold, that meal in the unassuming cafeteria turned out to be the best in our trip. With our tummies satiated, we took a cab to the hotel — this time we stayed in Saba Hotel ($35 per night) at the advice of a Singaporean I knew who came to this city last year. It was a spanking new hotel, with a very cheerful and amiable front desk guy who assisted us with whatever we needed, in a very personal rather than professional manner if this makes any sense. It’s people like these that truly makes Iran exceptional in my view. After dropping our bags in the hotel, the first place we went to was the majestic Imam Square. Said to be second only to Beijing’s Tiananmen Square in terms of size, this UNESCO World Heritage Site is frequently cited in travel books as one of the highlights of Iran, and rightfully so. The square itself presents three separate attractions in its premises, which are linked by a series of two-storeyed arcades which form part of the city’s Grand Bazaar. Let us take these one-by-one. First is a unique looking place of worship called Sheikh Lotfollah Mosque with its beautiful painted dome that changes color depending on the time of the day. Also known as the Lady’s Mosque, it is unique in the sense that it does not have the obligatory minarets which a mosque should have. At the same time, there was an Anti-US / Anti-Israel protest going on as our visit coincided with the anniversary of the US Embassy Hostage Taking in 1979. For one afternoon, I got that rare glimpse of the Iran which probably fit more into the general public’s imagination, one with rallyists chanting Anti-Western slogans and which portrays the United States to be the “Great Satan.” However, these occasions only occur maybe once a year and are not actually representative of what the general population really think of the US. 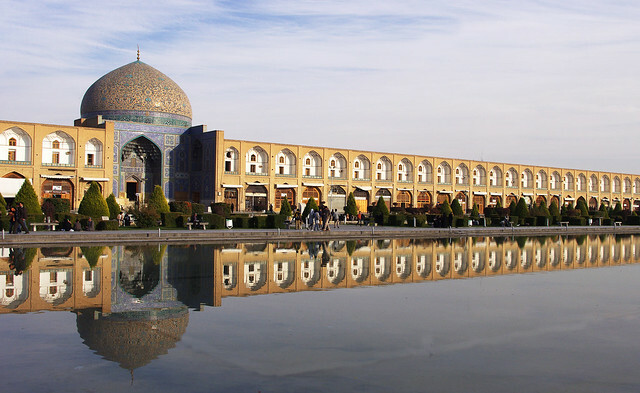 The third major landmark in the square is the Ali Qapu Palace, where the King of Persia used to reside when Esfahan was the capital during the 17th century. It was from this palace that the king used to witness the polo matches that were going on the square. Currently, it is a museum and this building is in constant repair. But thankfully, it is open to the public. Inside, there’s a lot of fascinating artwork from that era, and visitors can climb up to the very same balcony where the king used to view his subjects. After seeing the square, it was nearing dusk, which was perfect time to see another part of the city. This time, we walked down the main drag towards the (now dry) Zayandeh River. 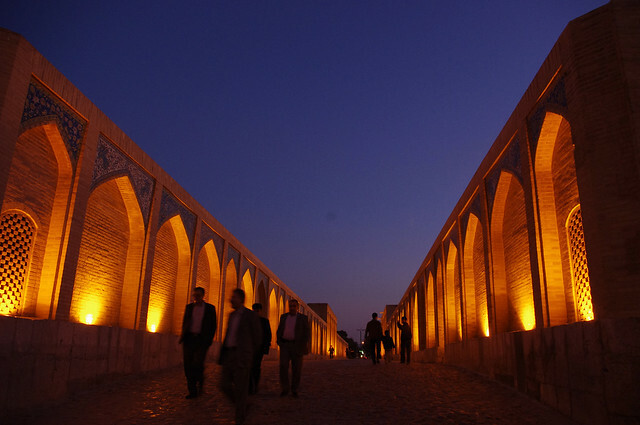 There are three historic bridges that span this river in Esfahan. Currently used as pedestrian crossings, they are nevertheless very scenic and add another charismatic dimension to the city. A relaxing activity that many locals do during the evenings is walk on the scenic parkland right by the riverside from bridge to bridge. We did the same and met many locals who wanted to talk to us. Some were having picnics there, while others – couples mostly – were hanging around appreciating the view and making the most of each other’s company in this highly conservative society. I started the next morning by visiting some of the sights we left off the previous day. Although I was already satisfied with Imam Square alone, some of my friends who had been to Iran previously recommended me to check out the Chehel Sotun Palace. It was a short walk away from Imam Square and very much accessible from our hotel. My friend’s recommendation turned out to be a great one. The previous king of Persia probably didn’t spare any expense from making the palace as grand as possible, especially on the inside. 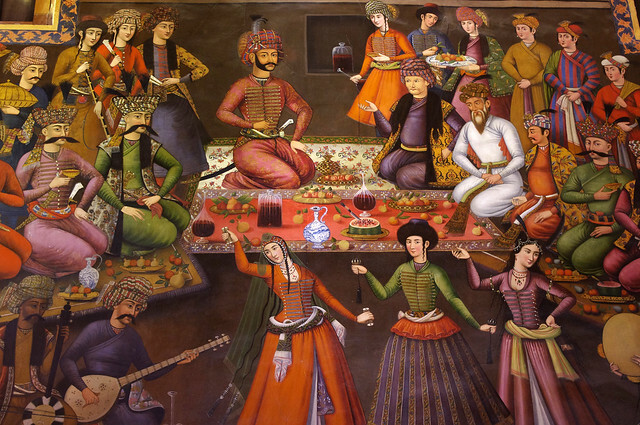 There is a lot of impressive artwork – from depictions of military victories over the Turks and Uzbeks to scenes of entertainment and receptions in the royal court. Outside, the main pavilion is flanked by a well-maintained garden which is also designated as a UNESCO World Heritage Site. After leaving this palace, I returned to Imam Square one last time knowing very well that I probably would not be able to return for quite a long time. I purposely just sat there by one of the benches. It was quite crowded that afternoon, more than what I remembered from the previous day. I knew full well that in typical Iranian fashion, someone would approach me and strike a conversation with me. It went exactly like that. Five minutes later, a group of students practicing English invited me to their circle to do some simple conversations with them. Then, an elderly couple invited me over and gave me some snacks. Afterwards, a group of teenagers approached me and had quite a long chat with me. The topics of course included the ever-present “What do you think of Iran?” One of the guys from this group then invited me to his house for dinner. 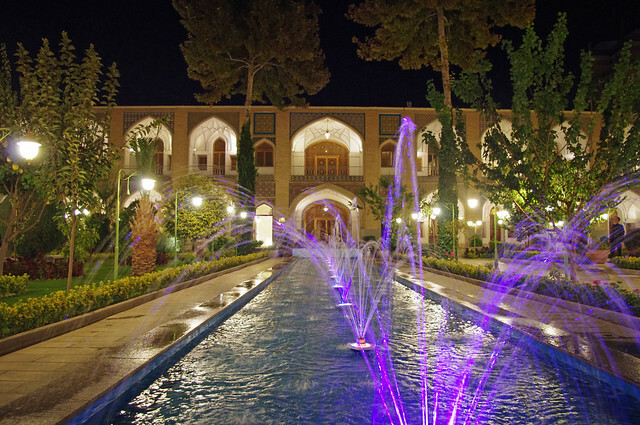 Overall, I found Esfahan to be quite a sophisticated city culturally and architecturally. Although it can be described as pretty, I still liked Yazd better. 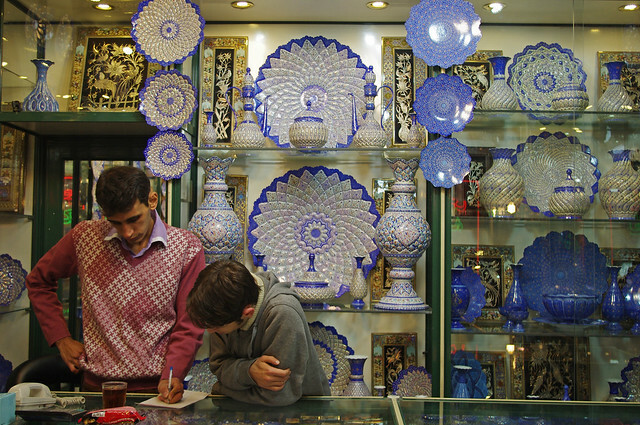 But nevertheless, there was a lot to see in Esfahan and I definitely enjoyed it. 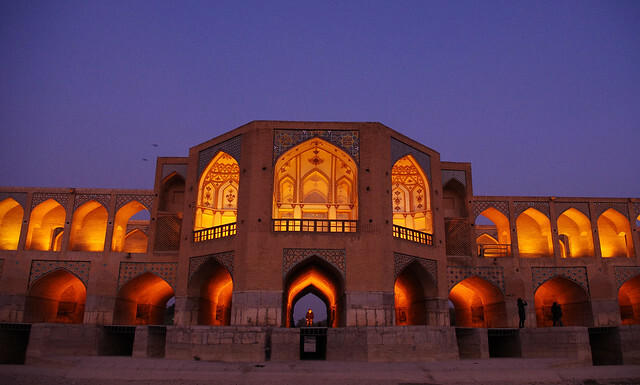 And although normally I would not want to return to a place I already visited, Esfahan is one of the few places that I would like to come back to. I found the people here to be much more inquisitive about foreigners than in other cities, and much more open to talk to me though this could stem from the better English proficiency that the locals have here compared to elsewhere. Esfahan is one fine city indeed. The Real Iran Pt5: Kashan! Kashan! 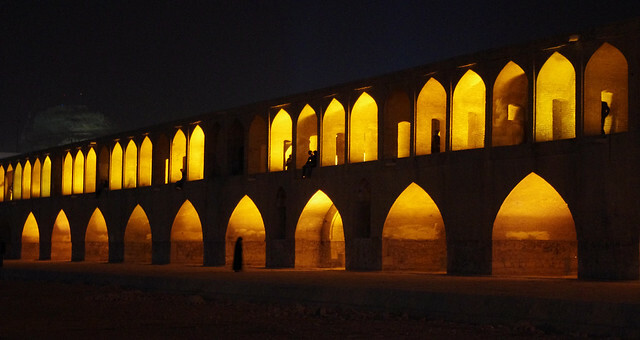 The Real Iran Pt1: Touchdown Shiraz – But No Wine? 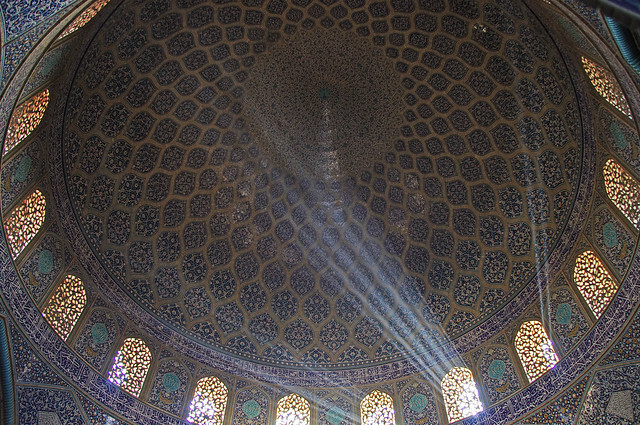 The first time I came across isfahan was in a book I bought many years ago and this time, a wonderful opportunity to read a blog written about it. Thank you so much for this post. Loved the photos you have! it’s a great city! was it from a travel guide? 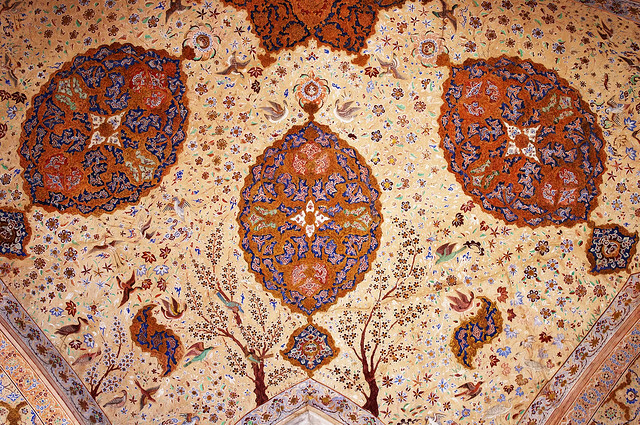 I love the intricate details in their artwork especially on the interiors and facade of the mosque. It is fascinating indeed. 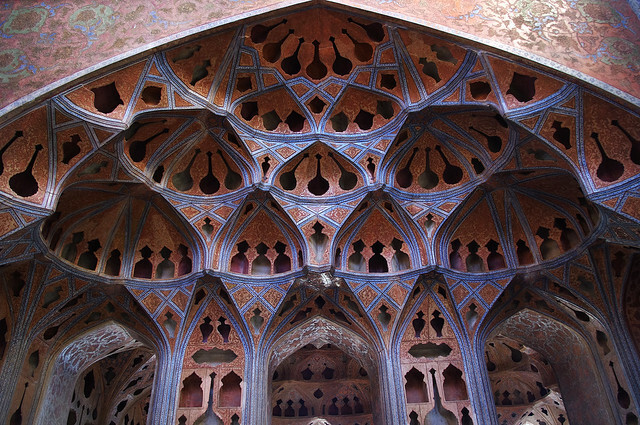 The Persian architects seem to have an obsession with symmetry and tiny intricate details. They’re supposed to enhance the spiritual atmosphere among the faithful. Just another coveted Persian architecture that many want to mimic, great! Persian architecture has definitely been exported the world over. Even the Taj Mahal in India is heavily influenced by the Persian style, the dome alone is already similar to the mosques in Iran, just that it’s painted white! bagal mag load nga photos po. 🙁 asteeg ng Persian architecture. most things i read in the news abt Iran are negative, like the most recent US backpackers w/c were finally freed frm who were captured there. but your story and photos tells us otherwise, that Iran is indeed beautiful. I’v learned something frm this post. keep it up. great captures! I hope I can viist Iran in the future too. Those occasional tourists who are captured for one reason or another usually involve illegal crossing in the land borders – those US backpackers were examples of this; and almost always involve westerners only. This is because of the poor diplomatic relations between Iran and most Western countries. For Asians, it’s usually fuss-free – the Philippines has pretty good diplomatic relations with Iran. Iran is a magnificent country, unfortunately due to blatant Western media propaganda it has a pathetic reputation. It is a respectable Islamic republic which works on universal franchise and isn’t a Taliban like dictatorship projected by the west. I think America and Europe should remove the ridiculous trade embargo which is creating further polarization rather than modernization. The people of Iran are there to select their government and political systems which best suit them. Since you are a Filipino I am in love with your culture. Jose Rizal is my role model and I like Pinoy Classic Rock, Juan Dela Cruze Band, Dawn, Sampaguita and Eraserheads. Just looking at your photos makes me want to go back. I think that Esfahan is the most beautiful city I’ve seen in more than twenty countries. I doubt that any other city will ever match it in terms of beauty! Where’s the ‘LOVE’ button! I absolutely LOVE this post and the photos! © All rights reserved. All images and text (unless otherwise stated) are owned by IWandered.net. Photos may not be used without permission.